Jane Marcet was a science writer, but that alone doesn’t qualify her as a famous scientist. In fact, Jane Marcet was the first female science writer ever, writing Conversations on Chemistry in 1806. Yet that still does not qualify her as a famous scientist, even though she wrote her book for girls in a time when education for girls was viewed as unimportant. No, the reason she is famous is that she wrote her chemistry book in a way that anyone with little formal education could understand, and it became the standard text in chemistry education. In Jane Marcet’s time, science was a field inhabited by wealthy people. It was very difficult for poorer people to get enough education to become scientists. But one poor boy, born in 1791, whose father had worked as a blacksmith, did it. The boy started work as an apprentice bookbinder aged 13, and went on to become one of the world’s greatest scientists, revolutionizing both physics and chemistry. “Mrs Marcet was a good friend to me, as she must have been to many of the human race. I entered the shop of a bookseller and bookbinder at the age of 13, in the year 1804, remained there 8 years, and during the chief part of the time bound books. Now it was in these books, in the hours after work, that I found the beginnings of my philosophy. There were two that especially helped me; the Encyclopedia Britannica, from which I gained my first notions of Electricity and Mrs. Marcet’s Conversations on Chemistry, which gave me my foundation in that science. … I was a very lively, imaginative person, and could believe in the Arabian Nights as easily as the Encyclopedia. 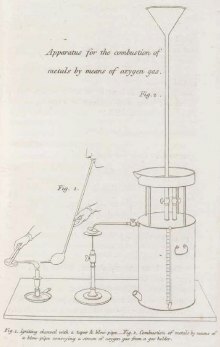 But facts were important to me and saved me… so when I questioned Mrs. Marcet’s book by such little experiments as I could find means to perform, and found it true to the facts as I could understand them, I felt that I had got hold of an anchor in chemical knowledge and clung fast to it. Jane Marcet’s book Conversations on Chemistry was so good, many schools in Great Britain started using it. It made its way to the United States, where Thomas Jefferson’s papers show he bought a copy in 1809. It became a standard textbook for girls’ education in America and was translated into both French and German. Amazingly, Jane Marcet was not a chemist and received no formal training in chemistry. So, how did she come to write such an influential book? Jane Marcet (pronounced marSAY) was born in London on the very first day of the year 1769. She was the daughter of the wealthy Swiss banker Anthony Francis Haldiman and his wife Jane. She was home-schooled. In 1799 she married Alexander Marcet, a Swiss medical doctor. The couple lived in London. Alexander, who was interested in chemistry, became a Fellow of the Royal Society and had a home-laboratory built. Jane became increasingly interested in chemistry. She began attending lectures at the Royal Institution given by eminent chemists such as Humphry Davy. She found these lectures confusing. Why was this? she wondered. Discussing the lectures with other attendees, she realized she was not alone in her confusion. She performed experiments at home and shared her thoughts with her husband, who had been formally educated in chemistry and understood her difficulties. Mrs Marcet decided to learn enough to write about chemistry in such a way that everyone who wanted to understand the subject could understand it. She wrote the book to help other people who were confused by chemistry. Her explanations were easier to understand than other textbooks, but they were still scientifically accurate for the time they were written. The book was user-friendly and treated its subject thoroughly in two volumes, each with more than 300 pages. It featured conversations between an adult who understood chemistry – Mrs. B, and two children who made comments and asked questions – Caroline and Emily. 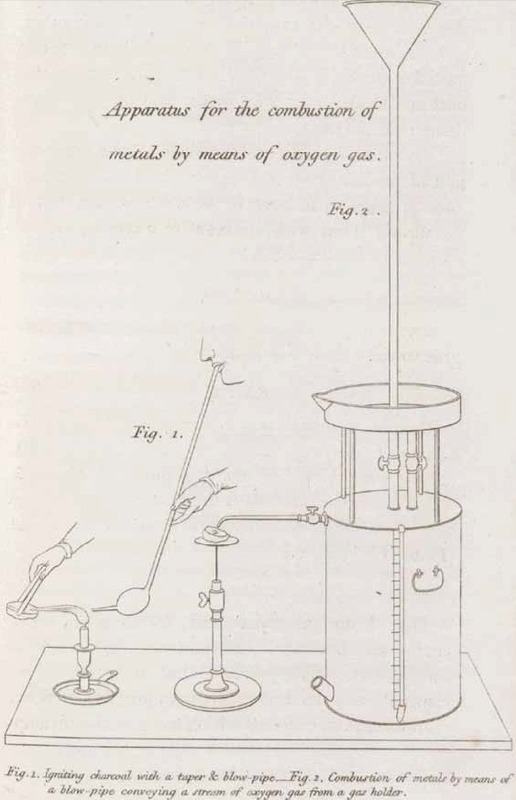 Jane Marcet also added her own drawings to help make her explanations even clearer, again helping people understand chemistry better. Are all the metals equally reactive with oxygen? No; their reactivities vary greatly. Some metals react with oxygen only at a very high temperature, or with the help of acids; while others react spontaneously and with great speed, even at the lowest temperatures. For example manganese hardly ever exists as the pure metal, because it immediately absorbs oxygen when it’s exposed to air. After a few hours, it forms manganese oxide and becomes powdery. Weren’t you able to extract oxygen gas from manganese oxide? Yes, because although manganese combines with oxygen easily at low temperatures, it releases it when strongly heated. Do any other metals combine with oxygen at room temperature? Yes, they all do, more or less, except for gold, silver and platinum. Copper, lead and iron react slowly with oxygen in air and cover themselves with a sort of rust, as the surface of the metal turns into a metal oxide. This rusty surface prevents the interior metal from oxidizing, as it prevents the air from coming into contact with it. The book was published in 16 editions spanning 1806 and 1853. Mrs Marcet was 84 years old when she released her final edition of the book. By 1833 events had come spectacularly full-circle. Michael Faraday’s work was featured in that year’s edition of Conversations on Chemistry. The boy who had been inspired by the book now had his work featured in the book. Ultimately the influence of Jane Marcet on science was enormous. She made it a subject that girls could consider pursuing, and she made it a subject that people who were not wealthy and who had only a few years of schooling could get to grips with. In doing so she inspired one of the greatest scientists in history and enabled him to learn enough about chemistry to start a scientific career. Thank you to Professor Tom Lee of Stanford University for indicating the correct pronunciation of Marcet. "Jane Marcet." Famous Scientists. famousscientists.org. 11 Aug. 2014. Web. I think that Jane Marcet was a wonderful person in loving memory the world misses you.